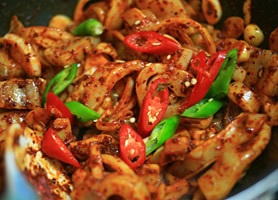 Ojinguh bokum is a spicy squid dish very similar to nakji bokum. Instead of using octopus tentacles, fresh squids are cut into bite-sized pieces then pan stir-fried with spicy gochujang along with gochugaru. Assortments of vegetable can include green & red chili peppers, mushrooms, green onions, carrots and onions. Some may find ojinguh bokum spicy even diluted with rice that may accompany this dish. Combination of ojinguh bokum and steamed white rice is common to make ojinguh dupbop which is a dish known as spicy squid over rice. Mix all sauce ingredients and set aside. Dilute with water as needed to control its spiciness. Clean squid and wash well in cold water. Cut head wing and tentacles from its body cavity. Slit the squid body cavity open and flatten. Cut into ¼ -½ inch wide strips from the head to the tail and then cut the strips into 2 inch sections. Slit tentacle ring, flatten and cut into desired biting pieces including head wing. Wash vegetables in cold water and trim all stems. Cut and slice into desired biting pieces for all vegetables. Preheat a large stir fry pan over high heat and add cooking oil. First add carrots and onions and stir fry for about 1 minute. Then add squid and green onions. Stir fry for 30 seconds. Add sauce and stir fry for additional 2 minutes. Sprinkle ground pepper to meet taste. Remove from heat and toss around with sesame oil.